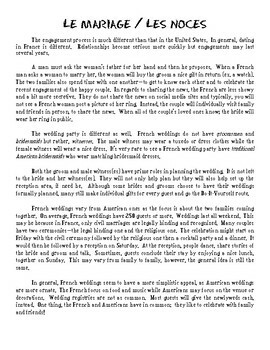 This is a cultural packet that discusses dating expressions, cultural notes on French weddings and related vocabulary. 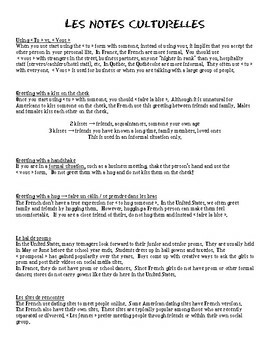 Cultural notes are in English. 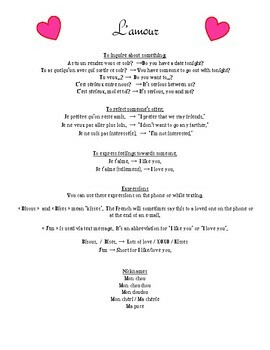 This can be used as part of a lesson anytime of the year or around Valentine's Day. Do you have students with disabilities that need their notes filled out in advance? Do you want to have the answers to everything? Good news: the key is included just for these reasons! 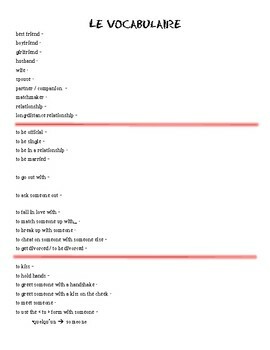 including how to text "I love you"
-Verbs that express "I'm dating..." or "I broke up with..."
-The verb « manquer » and how to correctly express "I miss you." and how to ask, "Do you miss me?" It also shows how to use « manquer » with other subject pronouns. -Explains the difference between « manquer » and « rater ». Examples are given. Please rate my product and follow me! I post new material often and occasionally have sales!